As Ginger Luke tells it, it all began with a delivery of Chinese food, a weiner dog locked in a bathroom, and a grumpy old man. While Luke has no idea what was in the man’s fortune cookie, if the dog had had one it would have read: This is your lucky day. The weiner dog was the first “client” of Ginger’s Pet Rescue, a nonprofit organization specializing in what Luke calls “death row dogs.” In two years, the program has found homes for nearly 1,000 dogs in danger of being euthanized simply because no one wanted to adopt them. Through a growing network of contacts at animal shelters, pet stores and elsewhere, Luke has created a successful system of locating loving homes for all types of dogs. “I promise each dog a loving home,” says Luke, 58, who owns the Rickshaw Restaurant in North Seattle, with her husband, Jakob Lueck, 54. Ginger Luke started a pet rescue that specializes saving “death row dogs.” Luke is with Wilbur, a French Bulldog with multiple medical problems. He now has a home and an owner who accommodates his special needs. Luke’s efforts started after Lueck heard a barking dog in the background every time he made a food delivery to a nearby apartment. When Luke handled the next delivery herself, she asked the owner about the dog. She was told it was a mean dog that was kept locked in the bathroom because it needed to be put down. Luke carefully opened the bathroom door. A flash of dachshund streaked from the room and into her arms. The dog’s collar was so tight it was embedded in his neck. Luke had to shell out $50 before the man would let her take the dog. She got the dog cleaned up, e-mailed 40 friends and found it a home. That initial effort produced a far greater response than Luke had expected. Other people she had contacted about the dachshund began telling her about other dogs in need of homes. Her networking ability, her persistence and the overwhelming need for homes for good dogs soon put Luke at the top of the lists for those doing dog rescues, including shelter volunteers. When others would fail to find homes for dogs and euthanasia seemed inevitable, they began contacting Luke. She secured nonprofit status, put up a Web site and then began getting e-mails about abused dogs directly from the public. The next thing she knew, her Blackberry was filling with messages. In no time, running the Rickshaw Restaurant would be done very late at night, or left to employees, and Luke and her husband were hauling around dog kennels in their dark red van and answering requests to take dogs to the vet for vaccinations, spaying and neutering, to foster homes, training and permanent homes with loving new owners. They paid most of the expenses themselves. 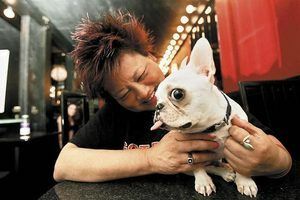 In Ellensburg alone, Ginger’s Pet Rescue has been credited with helping reduce the dogs that were euthanized annually from 560 to about 32. “If we didn’t have Ginger, we’d really have trouble getting the dogs out,” said Paula Hake, manager of the Ellensburg Animal Shelter. Luke turns down dogs that are obviously sick and dying or that have dangerous temperaments. But there are few of those cases. She’s found homes for dogs that are deaf, old, blind, albino, three-legged and in need of various surgeries to correct congenital problems. She charges $150 and up in adoption fees, which help cover some of the vet bills each dog requires. The money also helps her keep track of the dogs and new owners. Luke makes sure each match is a good one. Luke finds homes for the growing number of dogs from pet stores that find they can no longer sell the animals in the difficult economy. Many rescues are also from puppy mills since dog breeders have found that prospective buyers have other things to spend money on. Luke has a core group of 15 dedicated foster “parents,” who take the dogs until they can be placed, and a volunteer trainer to do temperament testing. Luke and her husband have funded the rescue through the restaurant, and they hope to find more volunteers and more donations of money, dog food, leashes, collars, veterinary care and training time. The nonprofit group has about 50 volunteers and is just starting to raise funds. Recently Luke and her husband were driving their van over Snoqualmie Pass to Ellensburg. On the floor between them was a container of colorful leashes and collars and in the back were kennels. A short time later they were on their way back, transporting Paige, a boxer-pit bull mix with an obsession for retrieving tennis balls; Herbie, a longhaired, energetic mix ready to play; and Micho, a sweet, white Chihuahua who loves walks. “We rescued 15 dogs this week!” she told Lueck as he drove. Then she scrolled through her Blackberry with its dozens of e-mails. “There are 56 dogs coming in!” she said. Without hesitation she dials the number of a foster parent.